GattiTown puts the “FUN” in fundraising - Weeknight FUNdraiser! GattiTown is committed to the community and to helping your school, group, church or team succeed! Our most successful FUNdraiser is our Weeknight FUNdraiser. 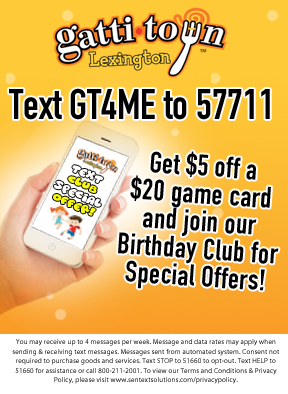 Get your group together for a night at GattiTown! Guests will enjoy our delicious buffet with pizza, pasta, bread sticks, salad, dessert and drinks as well as our game room/midway with indoor bumper cars and carousel. RECEIVE 20% OF BUFFET AND GAME CARD SALES YOUR GROUP BRINGS IN BETWEEN 5PM - 8PM! FUNdraisers can be held Monday - Thursday evenings. All purchases must be made at the front register to be credited to your group. We will provide artwork that you can copy, distribute, email or post on social media to advertise the event. Your guests simply show the cashier the printed flyer or image on their phone before making their purchase. It’s that simple! Call 859-559-4226 or click here today to get started raising money today! While we can’t contribute to all, Gattitown donates to many valid non-profit organizations every year. To submit a donation request, please click on the "contact" tab on this website and complete the required form. Please be specific in your request and provide your contact information. We will be in touch with you by phone or email if we are able to donate to your organization.